How can I order Synthroid 100mcg? If you have a low level of thyroid hormone in your body, your doctor may prescribe Synthroid 100mcg. 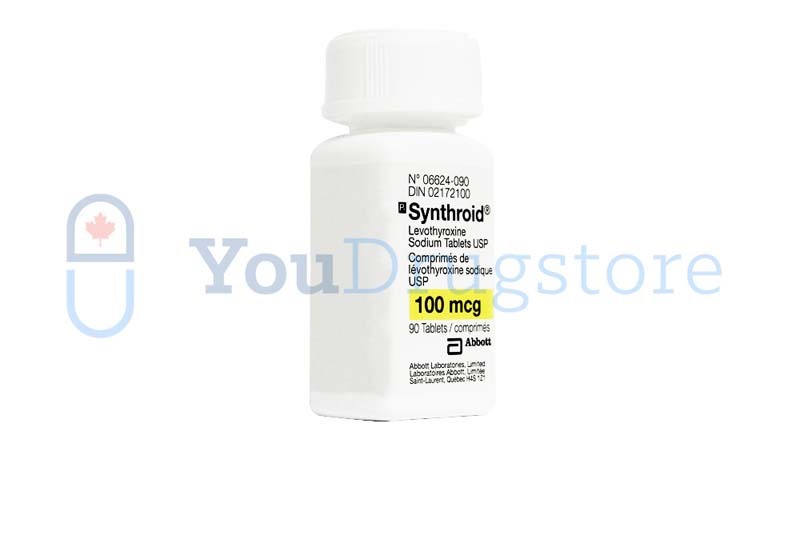 Before you can purchase Synthroid 100mcg from YouDrugstore, you must send us the prescription from your doctor. After careful evaluation, our pharmacy team will send you your Synthroid 100mcg. 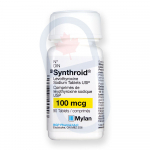 Ordering your prescription medication from YouDrugstore, a Canadian online pharmacy, can be a convenient way to purchase Synthroid 100mcg. How can Synthroid 100mcg help regulate thyroid hormones? 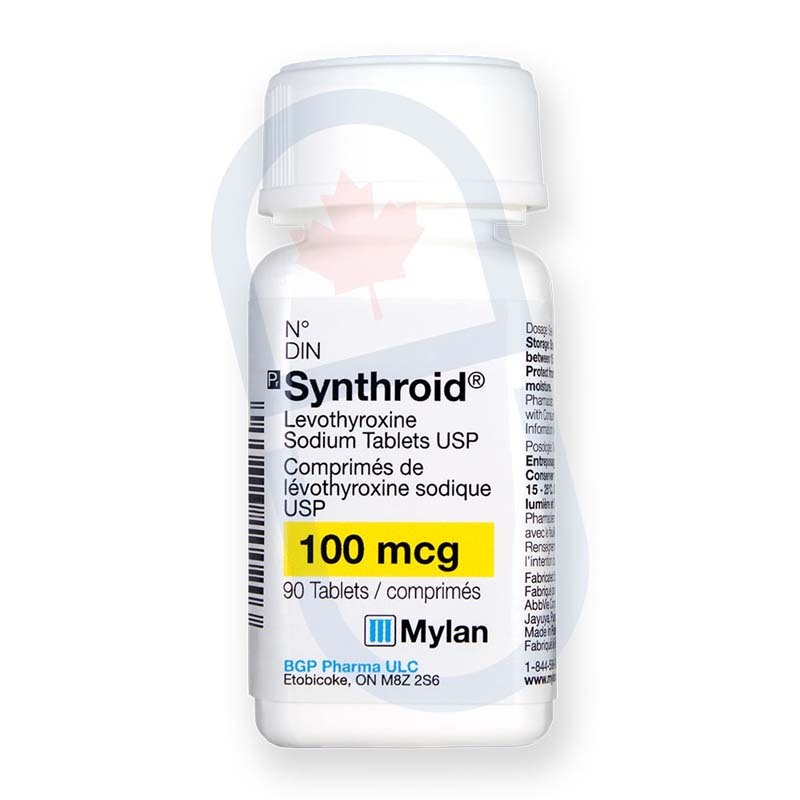 Synthroid 100mcg, whose generic name is levothyroxine, is a medicine which can help you regulate the level of thyroid hormone in your body. Synthroid 100mcg stimulates the thyroid gland so it can produce more hormones, which in turn regulate numerous processes within your body. Synthroid 100mcg is an effective treatment for goiter, better known as enlargement of the thyroid gland. Both children and adults can experience problems with their thyroid. Low or high levels of the thyroid hormone in your body negatively influences metabolic processes, which can lead to loss of energy or hyperactivity, changes in body temperature, issues with stool, weight loss or gain, dry skin, and problems sleeping. Although Synthroid 100mcg has an adverse effect on people with hyperactive thyroid gland, it can be an effective treatment for underactive thyroid gland. What happens within my body when I use Synthroid 100mcg? Lack of thyroid hormone can cause many medical issues. In some situations, doctors may need to surgically remove the thyroid gland from your body, but this gland is not like some other parts of the body and its function can be replaced with supplementation. Even if your body is not producing thyroid hormone, you can replenish it by using Synthroid 100mcg. This medicine serves as an artificial replacement for your thyroid hormone. Since there is no way to cure problems with the thyroid gland itself, nor will the gland regenerate if removed, it is necessary for patients like you to use medicines like Synthroid 100mcg during your entire life. How do I use Synthroid 100mcg? Take Synthroid 100mcg orally. You need to be careful when you take this drug because Synthroid 100mcg can dissolve rather quickly in the throat, causing choking. To prevent this, you need to take the Synthroid 100mcg pill with a glass of water so it goes down faster. Always take Synthroid 100mcg early in the morning, on an empty stomach, at least thirty minutes before your breakfast. Synthroid comes in different dosages so you must go through all the possible tests and analysis to find a perfect fit. Two major elements which are important for determining dosage are the patient’s body weight and thyroid levels in their body. Doctors can prescribe different dosages of Synthroid depending on your individual needs. What medical conditions can cause issues while using Synthroid 100mcg? You should not take Synthroid 100mcg for obesity of for losing weight. Although these are symptoms of a dysfunctional thyroid gland, a weight problem does not necessarily mean that you have a problem with your thyroid gland. Before using Synthroid 100mcg, you should tell your doctor if you have thyrotoxicosis, problems with your pituitary gland, diabetes, history of heart disease, blood clots, anemia, food disorder, osteoporosis, problems with your adrenal gland, or any allergy. If you do not have any of these issues your doctor may prescribe Synthroid 100mcg for your thyroid condition. What are the possible side effects when using Synthroid 100mcg? Some Synthroid 100mcg side effects are sweating, diarrhea, tiredness, headache, shortness of breath, and mood swings. In some cases, taking Synthroid 100mcg can lead to chest pain, seizures, swelling, and irregular heartbeat. If you notice any of these symptoms, notify your doctor immediately.